Hi dear friends, how are you all??? I missed u all from last week as am in away from my home so I couldn't post and do blog hop regularly... Sorry dearies... Coming with our traditional South Indian recipe, almost all of them love this and even every marriage it will occupy the banana leaf... Right??? Pongal is a popular rice dish in Tamil Nadu. 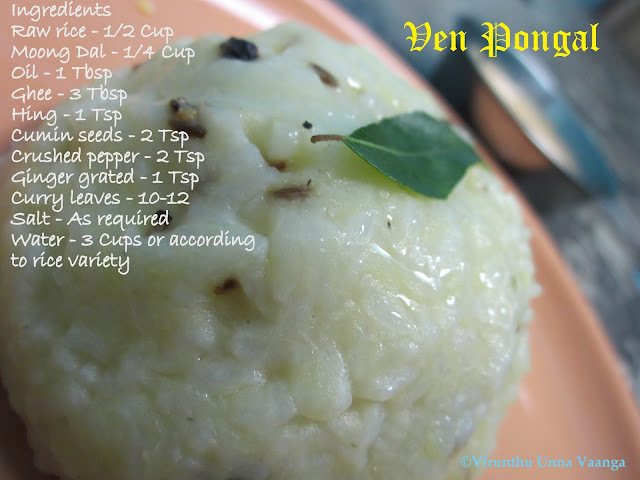 Pongal is unique to Tamil cuisine, Pong means "Boil over" or "Spill over". 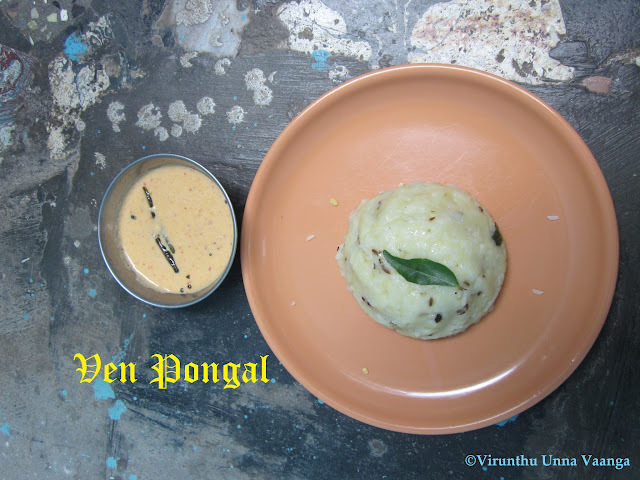 Pongal is the most simplest and easiest breakfast. 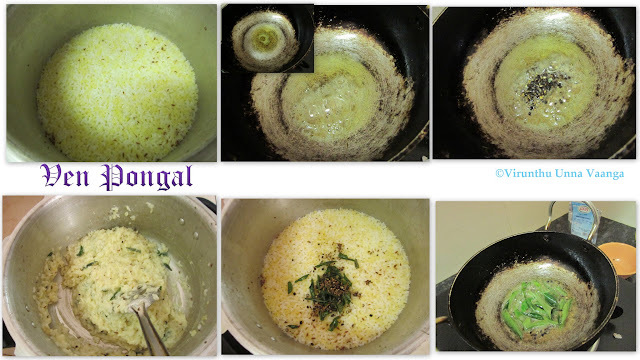 Cook raw rice and dal and then do the seasoning with spices. 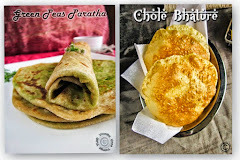 It give unique tastes while adding pure ghee. 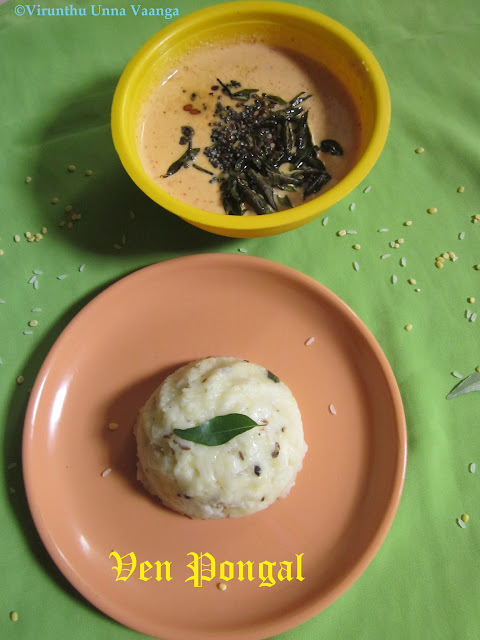 Its goes well with coconut chutney and sambhar. 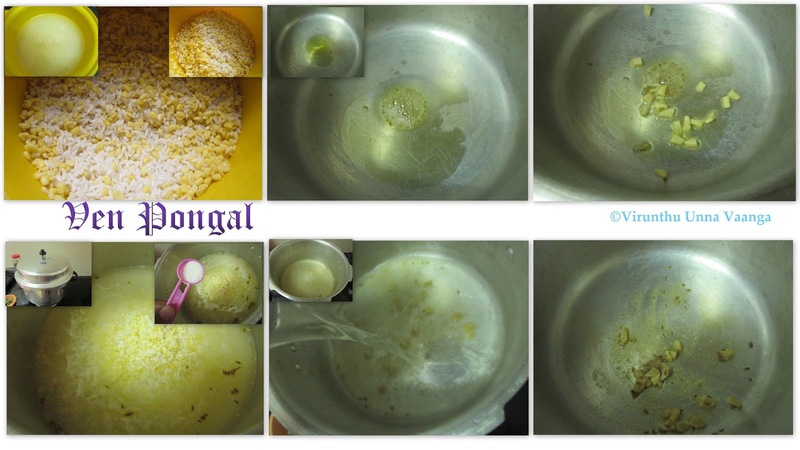 Wash rice and moong dal and soak it together for 15 minutes and drained. Now 1 Tbsp oil and 1 Tbsp ghee in a pressure pan then add hing and grated ginger and saute it for 1 minute. Now add water and salt and allow to boil. While it boiling add rice and moong dal and cover with lid when pressure comes out from the whole put the vent and wait for 5 whistles and switch off the flame. Let pressure will reduce at the same time, keep kadai in a flame add remaining 2 Tbsp Ghee and add cumin seeds wait it for splutter. Then add crushed pepper fry for 15 seconds then add curry leaves and switch off the flame. 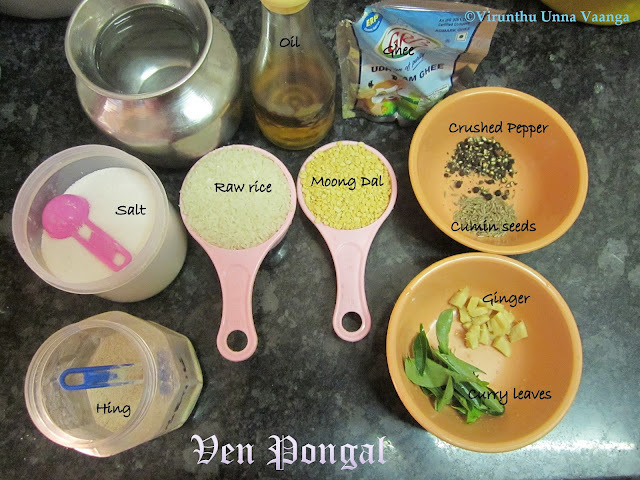 Open the pressure pan lid and transfer the seasoning into the rice dal mixture and mix it well. 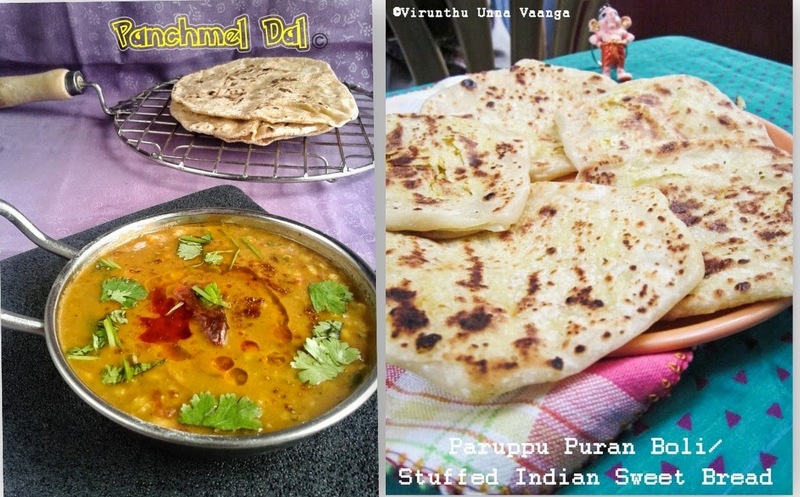 ENJOY THE TRADITIONAL UNBEATABLE BREAKFAST!!! If you want to be very rich in taste replace the oil with ghee, can add little more too. Can add cashew nuts with the seasoning to get rich taste and look. 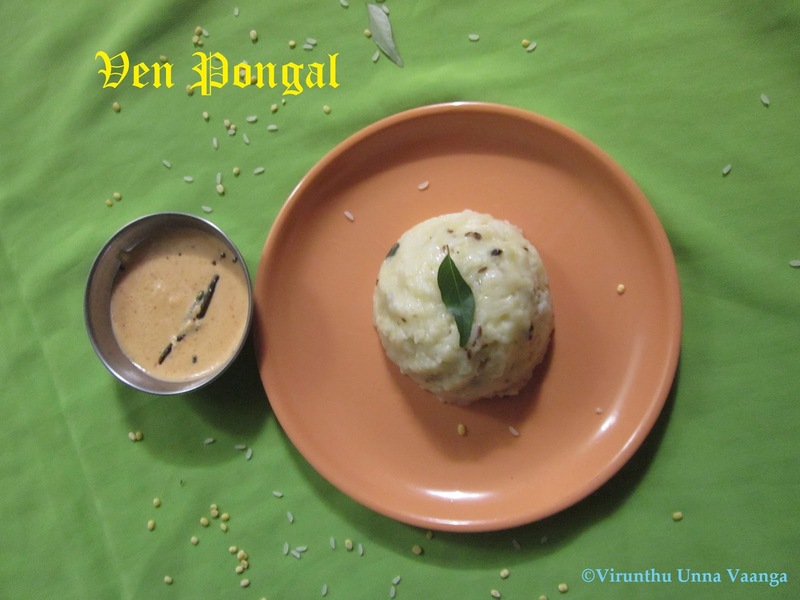 Delicious Pongal Viji, I just love it,a very healthy and filling breakfast. My all time fav breakfast...So tempting..
Udane veetuku varen sis.. POngal is my all time favourite, can have it for breakfast,lunch and dinner..loveeeeeee it that much. delicious pongal, one of my fave! 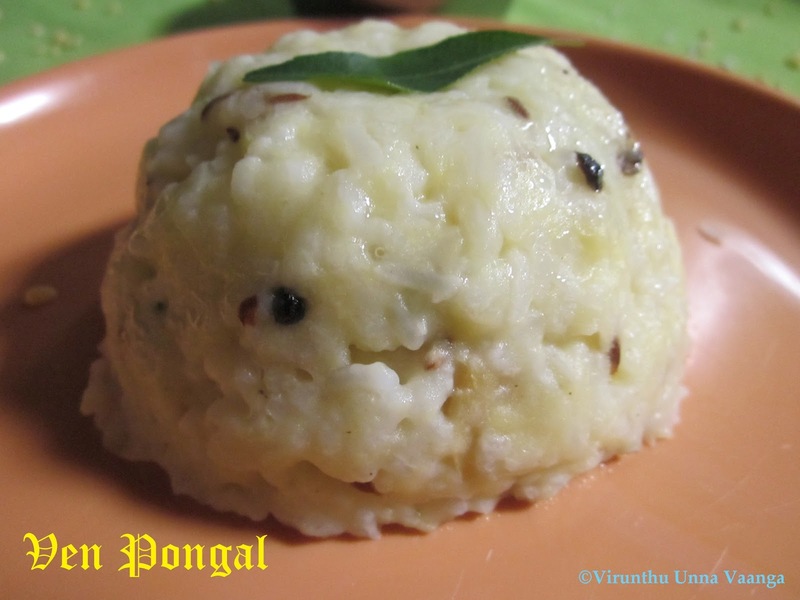 pongal all time favorite.looks so glossy. 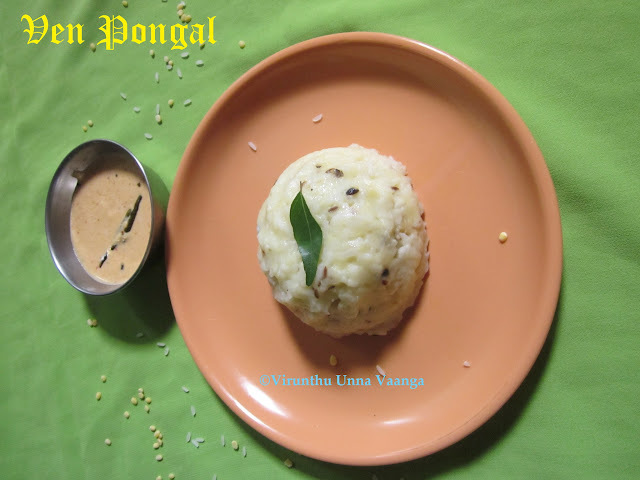 Mouthwatering pongal, wonderful breakfast idea. Looks delicious with the chutney..
Can you please pin to any giveaway for example on coffee machine/toaster its a one left for the event. I have email you in-regards above info.